Minutes away from beaches, surfing, tide pools, Sea World and much more! 7 Bedroom Sleeps 14! Property Size 5,000 sq. ft. This Point Loma vacation rental has a fantastic panoramic view of San Diego's skyline. The living room, dining room, and family room (all with fireplaces) open onto the largest of the three decks - a spacious place to barbecue, dine, lounge, and watch the boats on San Diego Bay. This set up makes a convenient place for entertaining, be it a business meeting, family reunion, birthday, graduation, or anniversary celebration. 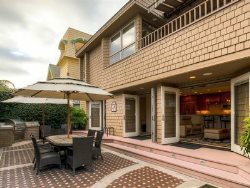 This large vacation home rental is about a 7 minute drive to the airport, beaches and to surfing, tide pools, skateboard park, Cabrillo National Monument, Point Loma Lighthouse, deep-sea fishing and diving, sailing, kayaking, tennis, and golf.Sea World, Mission Bay, and Sail Bay are just across the bridge. On the bay side of the point, pick up a deep-sea fishing charter in the old Portuguese fishing village of Point Loma, home to the San Diego Yacht Club and Humphreys Concerts By the Bay on Shelter Island. A short scenic drive from Point Loma around the harbor takes you to the airport, Harbor Island, and the downtown waterfront. On this beautiful bay, you can tour the Aircraft Carrier Museum, the Santa Maria replica, the old Star of India sailing ship, or take a harbor cruise. Stroll further down the bay past cruise ship docks to Seaport Village to eat, shop, or just have an espresso at Upstart Crow, a family-owned south to the waterfront park for the outdoor concerts, or take the ferry across the bay to Coronado Island for lunch or dinner. Walk up Broadway to Horton Plaza, guaranteed a one-of-a-kind mall. A few blocks away is the Gas Lamp District with its great old architecture, sidewalk restaurants, and teeming nightlife. you take the Laurel exit off Harbor Drive and follow it up the steep hill to its end, you will be in Balboa Park, home of the San Diego Zoo, Old Globe Theater, Japanese Garden, Reuben H. Fleet Science Center, IMAX Theater, and eight museums. Presidio Park and Old Town, the first European settlement in California, are just two exits north of Laurel. This Point Loma vacation rental is not a self check in home. One of our friendly greeters will meet you at the house to give you a tour, go over our noise policy again and to answer any questions you may have. PLEASE NOTE: Our rental agreement includes a no tolerance policy regarding noise disturbances, over occupancy and/or parties. Deposit forfeitures, fines and evictions for violations are strictly enforced. Please make sure you are comfortable with these policies and closely read the contract terms and conditions before renting with Wanderlust. THIS HOME IN A NON-SMOKING HOME. IF A MEMBER OF YOUR GROUP IS A SMOKER, PLEASE SMOKE OUTDOORS ONLY, ENSURING THAT WINDOWS ARE CLOSED AND BUTTS / ASHES ARE DISPOSED OF PROPERLY. FINES MAY BE IMPOSED FOR SMOKE REMEDIATION, DAMAGES OR ADDITIONAL CLEANING. Lisa was great, she responded very quickly when I had questions and recommended great places to eat. Lisa responded quickly every time. Follows up with concerns, and offers many suggestions. She made the experience smooth and easy. The house view was great, most of the best were softer than expected!!! 5 stars for the master bedroom bed. If you forgot to put your eye protection on you were awake by 6am when the sun came up with the views.The views were worth the money too. We'd like to thank Lisa for her hospitality. Communication was great and the house was perfect for our big group. We would definitely stay there again and recommend to others.